I am becoming increasingly familiar with the smell of rot. The husband and I were on a small road-trip to a friend’s birthday the other day, and we were driving up and down some lovely backwoods roads in the Appalachians to get there. It was nice to get a breath of somewhat cleaner air than we’re normally treated to, and the sight of mountains covered in verdant green and carbon-tinted shade under blue skies always fills my heart with a quiet joy. Smells of crab shacks, flowers, cow dung, corn fields, and daytime mountain winds mingled with the cologne we wore and the menthols we smoked along the way. And, yes, at several points during the drive, my nose would unfailingly twitch as we’d drive past the occasional roadkilled raccoon or hunted deer or whatnot. To clarify: I use the word “rot” to mean the smell of a once-living animal that has died or been killed. Yes, plants and fungus and other organic matter can decay in their own ways, and perhaps there’s a better word for the smell I’m describing besides something dead-animalian. Though it’s certainly not what I’d consider pleasant, it’s not so offensive that I can’t stand to be around it. Sure, I’d rather avoid smelling it, but it won’t stop me from the Work at hand. I’ve always heard that rot smells sickeningly sweet, but…maybe I have a different notion of sweetness than those who made up that timeworn phrase. I try to take out the trash regularly enough, keep the fridge cleaned out, and wipe down the showers, but those tend to have the smells of food gone bad, mold in the tupperware, or mildew on the tiles. These are not the smells of rot as I’d consider it; these are the smells of things going sour or sickening, but not of rot. Rot has a distinct profile to the smell, and one that’s surprisingly difficult for me to describe. It’s something totally different than anything else I’ve smelled: something like a mixture of pink cotton candy, overly ripe fruit on the edge of fermentation, old steel, dirt after the rain, and the idea itself of revolting (lit. “turning away”). Sure, the specific thing that’s rotting will color the smell differently, whether it’s skin or feather or fur or leaves or wood, but that core smell in the middle of it is unmistakable. The way the smell seems to travel feels different than other smells, too. While foods or pheromones or perfumes seem to waft like ribbons of invisible smoke in the air, rot crawls and seeps like a slow, glacial flood that is just as hard to get rid of once it’s there. It lurks behind other smells, making it difficult to mask or suffumigate or sweep under the carpet; there’s always some tiny, faintly pungent hint of it always reminding you that something there has died. Some people would even say that the smell is capital-w Wrong, like something is trying to force you out of the room, or something is setting off alarm bells to make your hair stand on end in the lizard brain we humans’ve got. And yet, despite all this, I cannot bring myself to call rot a “smell of death” as I’ve also heard it described. Yes, it is a smell of things that are dead, but it is not the smell of death. When an animal dies, that is not the end of the story. Sure, the soul or spirit or mind of the thing might dissipate or go elsewhere, depending on which cosmology you’re following, but the body continues to exist in the physical world, and the body is nowhere near done. It becomes a breeding ground for bacteria, parasites, fungus, and even insects. It becomes a food and a host, and the toxic smell that humans have innately, instinctively evolved to reject is the olfactory evidence that everything continues in the world. Call it the “circle of life”, if you will; just because a thing dies does not mean that’s the end of the story for the thing. It continues to exist to nourish, to fertilize, to disintegrate, to return to its base elements for the repurposing and recycling of all things in this world as constituent parts into new and more exciting forms. I’m not so certain anymore. Things that are dead are not death itself. Much as nature abhors a vacuum, I claim that our world does not abide death. Life exists to beget more life, and if death weren’t a limiting constraint on these things, life would always and only serve to beget more life in one way or another. Death is…unwelcome, in many ways, though a necessary law in the world. But, to me, it feels increasingly like death is something Other, something Else, something Different than anything else in the world. It does not feel part of this world in the same way that conception, flirting, hate, offices, rituals, or fruit feels like a part of this world. Death is like a vacuum; if this world is composed of Life, then what place does Death have? The Japanese language has an interesting idea that makes English students a little distressed: there is no way to say “I’m dying” in Japanese. In Japanese, gerundive forms (sometimes called the “-te form” of a verb) are what’s used to make a progressive action when used with the supplemental verb iru; for instance, taberu means “to eat”, while tabete iru means “to be eating”. However, in Japanese, shinu “to die” has the progressive form shinde iru, which isn’t “to be dying” but rather “to be dead”. For speakers of Japanese, the act of dying is something that can only happen in a single moment; it is not something that can be prolonged, continued, or stretched out temporally. One is going to die at some point in the future, one dies is in this very moment, one died at some point in the past, or one is in the state of being dead. There is no “one is dying across time” in Japanese; it is a transition from one state to another, and there is no grey area between the two. Either you are animated or you are inanimate, you breathe or you cease to draw breath, you live or you are dead. It still seems like Death is something so distinctly different, so Other, that it does not belong to this world. And yet, that doesn’t seem like a right claim to make; even I think I sound like some willful child raging against having to flush their expired goldfish down the toilet because “it’s not right” or “this shouldn’t happen”. I do not mean to say in the least that Death is something unnecessary, forced upon us, or wrong; far from it! Life here on this planet would be a Malthusian hellscape without death to regulate us and keep us in check. Death is the rightful end of life, and the (generally, hopefully) rightful point at which our spirits shake off their physical forms and go their separate ways. We all know and have heard from innumerable traditions that Death belongs to this world just as much as Life does. Yet, what is Death, then? We know of the dead; they’re “here” as much as any spirit, but then, they’re not “here” in the same sense as you or me, since we’re incarnate and they’re not. It’s like they’re just beyond the chiffon curtain in the room, on a slightly different frequency a half-kHz up on the radio. They’re not part of this world of physical forms and bodies, barring any attachments or grounding to bones or artifacts of the dead, so we can leave them out of the picture for the time being. What is Death, then, if Death can be considered a spirit, one of the very few able to directly interact with the living processes of this world strong enough to quell them? Is it truly some specter or shade, skeletal and robed in black-white-red with a scythe and an owl on their shoulder, swooping in to catch her prey? Is it some king of a hell-realm with four eyes and wide nostrils and two dogs, chasing people down and bringing them to his doorstep as prisoners? Is it a radiant angel, taking people by the hand and elevating them from their bodies for the last time? Is it an ancient woman, one of three sisters, who cuts the thread of light at its right proportion and length? None of those, either, seem right. 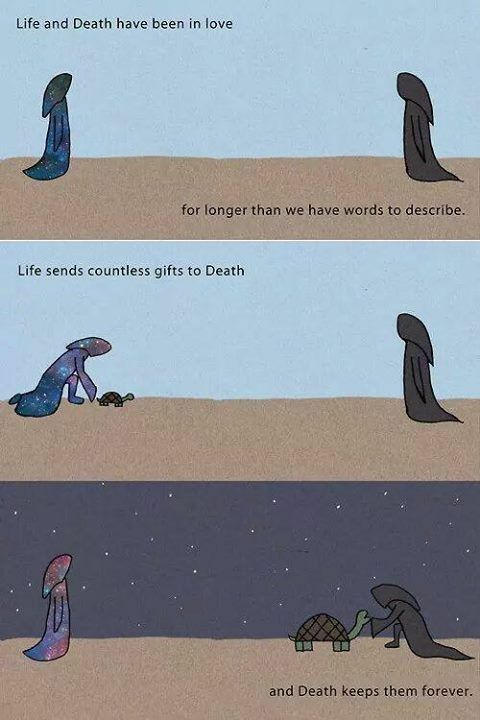 Sure, they’re ways we can personify and interact with Death as a spirit, but they are themselves not Death. After all, even gods themselves die, some more permanently than others, and there is some precedent (even if I’ve only come across it in games like Neverwinter Nights) that Death is a non-entity apart from any spirit or god, even those related to or administering the sacrament of death. Plus, what sort of crazy exception of a spirit would Death then have to be, to be so powerful as to directly interfere with living creatures on a level totally unseen and unheard of when compared to literally every other deity and spirit, save for those religious texts where miracles happen de rigueur? It does not seem right to claim that Death is a spirit, any more than Life itself is a spirit. It is a phenomenon that happens in our world naturally, and therefore must be a natural part of this world, too. It is the exact moment of transition from animacy to inanimacy, and therefore is not an action in the same way “eating” is an action, both because it is a state transition and because it is…probably? difficult to impossible for a living body to intentionally, intentfully die without causing its own death. Like, a body can continue breathing, pumping blood, digesting, wiggling in the dirt, and so on, but dying is not something the body can just do. Dying happens as a result of other natural processes: the failure of parts of the body (from the organ scale to the cellular scale) to function together concordantly, trauma inducing failure of the body, disease inducing failure of the body, or so forth. When Life cannot continue, Death occurs. When Life fails to proceed “normally”, Death occurs. And yet, Death is as needed, as necessary, and as natural as Life; it’s not that Death is inimical to Life, or Death is something “wrong”, but that the one picks up where the other leaves off. And Death then becomes the endpoint for physical incarnation, after which, the story of that spirit that once animated a body, which existed only once for a short while and in a limited location in such a form in all of infinite time and boundless space, continues outside this world of physical forms. The body begins its own dissolution, the spirit continues its own analysis, but the story ends for the two of them together. Rot is the smell of the world reclaiming its due and collecting its own spare resources for other purposes. Sure, it smells toxic and wrong to us, not only because we’ve evolved to avoid it for health and survival reasons, but because it reminds us that, as living bodies, that is something that we’re not yet ready for, and something that we won’t necessarily be around to witness once it happens to ourselves. Rot is something that happens when you’re already shinde iru; it is not the smell of shinu, although it may be a reminder of it. Yet, look what happens when rot is not allowed to happen. Consider the Red Forest in the Chernobyl Exclusion Zone; the leaves from the trees there do not rot, due to the toxic radiation they’ve all been exposed to. Things there persist long after they have any right to, just as bodies preserved with formaldehyde or encased in glacial ice for millennia. These are things that cannot return to the world; they may as well be ejected by rockets from the Earth as space junk, lost and unusable to the world forever, except they linger on posing a space-wasting and ecological threat of disaster to everything around it, like a cancer in the body unwilling to be flushed out by its neighboring cells. They cannot undergo the total process of life. See, also, why zombies and the undead generally cannot be permitted in the world, as they take something already in the process of life-after-death (rot) and hijack it. Either the zombie in question continues to rot, leaving its new consciousness to die a new death, or the zombie is preserved against rot and cannot continue the process of life proper; unnatural, to be sure. The smell of rot tells me (besides the fact that I need to air out my basement more) that death is always around me. Rot is a necessary and natural part of all these physical bodies: things that are made (created) to die that are also things that are made (forced) to die. Rot is the “Kilroy Was Here” graffiti that Death leaves behind; it is the trash collector routine of the CPU of the world we inhabit. Yet rot does not show me what Death is.